Demand for fast, convenient purchasing has seen the EPoS industry boom in the last few years and it shows no sign of slowing as customers become more and more acquainted with their robotic friends. As we shift to enhancing a customer's experience through automated service, self service solutions are in demand. 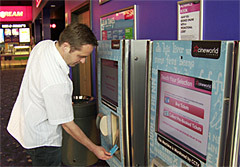 Retail stores and supermarkets are now leading the way with their embrace of self-service payment kiosks. With their free standing or wall mounted design, EPoS kiosks fits easily into any in-door spot where they can work alongside staff to improve both profitability and customer experience. EPoS kiosks offer a great number of transactional services including: payment, ordering, product information and receipt printing; utilising many innovative devices like chip and pin, RFID, bluetooth, web cameras, printers, scanners, wifi and much more. They can be customised to your requirements, accept a wide combination of accessories and can be easily updated. If you’re looking for the most reliable, cost-eff­ective and versatile kiosk solution for your store contact us today.